Cooking Mama is back, and this time she has a new puzzle game for all you armchair chefs out there! Let’s Cook Puzzle offers a refreshing take on the match-3 puzzle genre. It simplifies game mechanics to make gameplay fast-paced, addicting and enjoyable. All you have to do is connect 3 or more Foo-Dons or ingredient characters by keeping them close to each other and then tapping on them to prepare dishes for customers. You can even drag an ingredient to ingredients of the same type and then match them to make a dish. Happy customers will give you coins in return with which you can purchase power-ups. The more connected Foo-Dons (ingredients) you tap to make dishes, the faster the diner satisfaction or “Happy” meter fills up. Once full, you will receive coins. To fill the meter faster, you can collect and connect more than 3 ingredients and then tap on them or keep tapping rapidly on small groups of Foo-Dons. You can even create a jumbo Foo-Don, but for that you will have to tap and hold 3 or more connected ingredients to create one. Since you have to race against time, tapping on Foo-Dons placed close to each other rapidly seems a more viable approach in filling up the happiness meter faster. Rapid tapping on groups of 3 Foo-Dons will create dishes faster and newer ingredients will keep appearing from above. This way you will make more customers happy and also fill the “Heat Up” meter faster. Once full, this meter can really boost your dish preparation and you may end up satisfying more customers. Remember that a customer leaves when the meter fills up and only then you earn coins. Your goal is to fill the Happy meter faster to bring more diners to your shop. And more happy diners = more coins! When the game starts, quickly scan the vessel to search for matches of 3 or more. Keep tapping on a group of ingredients, big or small, to make dishes quickly and fill the Happy meter. You may drag a Foo-Don or two to connect to ingredients of the same type when you can’t find any matches, but your priority should be to search for connected Foo-Dons and tapping on them. Tapping a large group of connected ingredients will also fill the meter faster, but if you spend time gathering ingredients of the same type in one corner of the vessel in the hopes of creating a large Foo-Don or silver spice, then you are wasting a lot of time. You don’t know what ingredients will fall from above and will end up satisfying fewer customers. So go for rapid tapping instead of connecting Foo-Dons to create large groups if your goal is to earn more coins and get a high score. Rapid ingredient match is a better approach if you want to fill up “Papa’s” satisfaction meter, and by now you know how difficult it is to keep papa happy! When you begin playing a puzzle, keep an eye on the leader Foo-Don meter at the bottom right corner of the screen. When it fills up, quickly tap on it to activate its skill. – If this is your leader, then it can power-up your dish, increasing the satisfaction meter faster. – My favorite Foo-Don. If this ingredient is your leader, you are in luck. When you tap on the leader meter, Mama will make dishes for you for a few seconds. You will notice dishes appear out of nowhere and are served to customers. – Activating Berry-don’s skill will freeze the timer for a few seconds. – If this is your leader, tapping on the full Pan-Don meter will make a Golden spice appear in your vessel. Don’t forget to tap on the Golden Spice to turn ingredients to dishes! – active Che-don’s skill and then tap on any Foo-Don to make dishes. As you progress, you will unlock more ingredients and each ingredient will have a unique skill that can help you score more points and get extra coins. Completing all shop quests not only unlocks a new shop, but also gives you coin bonuses and extra lives. To know what bonuses shop quests give, tap on the rewards button above the stars on your home screen. To see a list of quests, tap on stars above the big Play button. You can also access the shop quest list while playing. Tap on the pause button to check which quests you have completed so far and which are pending. Some quests require you to complete it in one game and have a “1 Play” label beside them. If you can’t complete a 1 Play quest, you will have to try again. There are also quests that do not need players to complete in one game and have a “Total” label beside them. You can take your own time completing such quests. Numbers gets added to the total after finishing a puzzle. If the quest requires you to complete 120 recipes, and if you have completed 30 recipes in a single puzzle, then these 30 recipes will be added to the total and you will have to make 90 more recipes to complete that quest. You can keep playing on the same shop to make 90 more recipes. Silver Spice can be created by placing 15 similar Foo-Don’s close to each other and tapping on one of them. Once Silver Spice appears on the vessel, wait for it to settle down; don’t tap on it when it floats on the top of other Foo-dons. Let it come down and mix with different types of ingredients. Tap on the Silver Spice to turn surrounding ingredients into food. Creating Silver Spice takes time and you wouldn’t want to waste your time sifting through ingredients and gathering 15 Foo-dons of the same type together while the timer is ticking away! If you see a large match opportunity and find too many ingredients of the same type in a vessel, then you can wait for some time for new ingredients to appear. 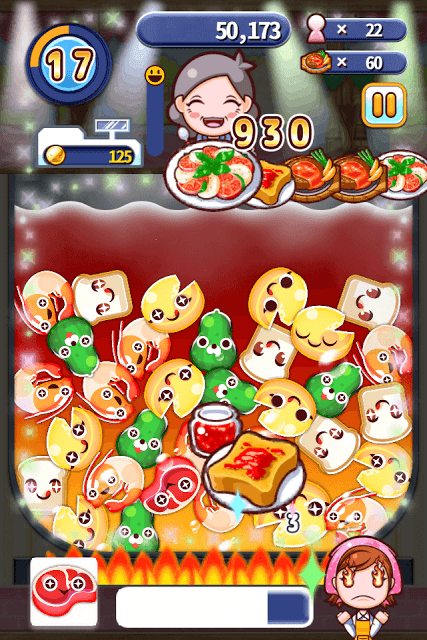 Keep connecting and tapping smaller groups so that new ingredients appear from above and once you have collected all 15 Foo-Dons of the same type, connect and tap on them to create a Silver Spice. In Cooking Mama: Let’s Cook Puzzle, there are a total of 6 power-ups. While every power-up can help you in one way or the other, I would recommend investing your hard-earned coins on the Timer power-up (costs 4000 coins) and the “Foo-Don reduced” power-up (costs 5600 coins). The timer power-up adds 10 extra seconds to play time and the Foo-Don Reduced power-up makes sure that only 4 Foo-Don types appear in the vessel. With only 4 Foo-Don types, it will be easier for you to match them faster. After purchasing a power-up, you will have to tap on it and press the “OK” button to use it.